Patanjali (Orissa, 2005) at Yoga St. Louis. The following two Sanskrit verses initiate the Bhojavrtti, a word-for-word explanation of the Yoga Sutras of Patanjali (second century B.C.E. ), by the eleventh century savant king Bhojaraja. Patanjali is also traditionally attributed with the seminal works on both medicine (the eighth century B.C.E. Caraka Samhita) and grammar (Panini’s third century B.C.E. Mahabhashya) thus the credit for purifying body, mind and speech. Each symbolic element reminds the yogin that the purpose of his life is to turn the mind inward and guide it towards illumination, liberation and Self-realization. According to legend, Patanjali was born fully self-realized when the aged yogini Gonika, praying for a son to whom to impart her wisdom, offered a handful of water to the Sun God. A tiny snake fell into the water and then took human form, whom she named Pata (“fallen”) – anjali (“hands folded in prayer”). 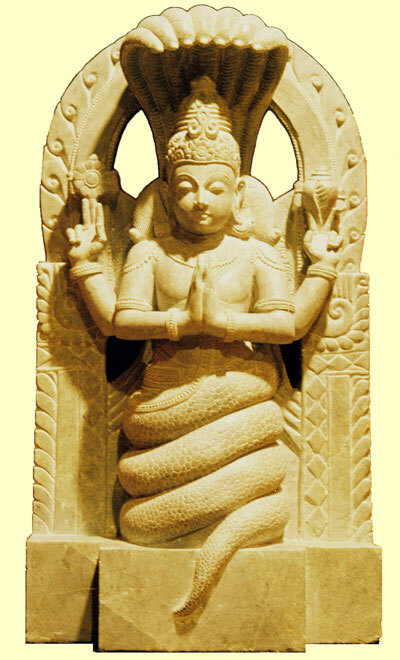 Patanjali is depicted as having the upper body of a human and the lower body of a coiled serpent. The three and a half coils represent the triguna (sattva, rajas and tamas) and the gunatita, the transcended state that lies beyond the influence of the gunas (PYS I.16 and IV.34). Patanjali uses three weapons — a conch, a disc, and a sword — to restrain the citta vrttis, the movements of consciousness (PYS I.2), remove the obstacles (PYS I.29) and eradicate the afflictions (PYS IV.30). The sankha calls practitioners to lead a pure and noble life and to seek the Self within. The buddhi (intellect) guides the mind towards sattva, illumination, and liberation — and away from rajas (excitement), tamas (dullness)and bhoga, (worldly enjoyment). The sankha also alerts the practitioner to be ready to face the inevitable obstacles and afflictions of yoga practice (PYS I.30-31and PYS II.3). Krishna also used the discus as a weapon of enlightenment to cut off the heads of the tamasic demons. The asi is tucked in the waist — to destroy avidya, spiritual ignorance, and cut the arrogance of asmita (egoism or pride) that covers the pure being (PYS II.3). The hood assures the protection of the Lord when the yogin surrenders to God with his palms in namaskara. As the hood turns inward, so does the citta, consciousness, involute to concentrate only on the sight of the soul (atma darsana). The thousand heads are the multitude of thoughts directed into a single pointed meditation. 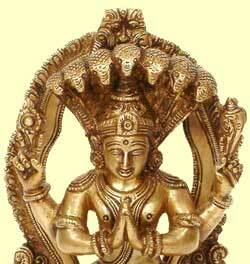 They also represent the multitude of ways in which Patanjali guides the yogin. The cobra’s white color signifies sattvic purity. Patanjali’s crown represents sovereignty, the command that comes with sattvic illumination when the will is unimpeded by the obstacles of yoga. These represent the four aspects of the psyche: manas (mind), buddhi (intellect), ahamkara (ego), and citta (consciousness). Each palm represents the separate jivatman, the individual soul. The five fingers are associated with the panca kosas, the five nested sheaths of the sarira (body): annamaya kosa (structural), pranamaya kosa (physiological), manomaya kosa (psychological), vijnanamaya kosa (intellectual) and anandamaya kosa (spiritual bliss). The coils represent the divine kundalini energy that lays dormant and coiled at the muladhara cakra. When awakened, it winds through the body three and a half times from the base of the spine to the top of the head, at the sahasra cakra, the thousand petaled lotus. The three coils also refer to three major nadis (channels of subtle energy): the lunar ida on the left and the solar pingala on the right, both of which feed the susumna in the center. The divine citra nadi, which originates at the heart and extends to the head, is represented by the half coil.